Team up! Are you up for it? Put your hand in mine, it is a perfect fit! That is because Prereleases for Team Up are starting this weekend.! They will be the last two weekends of January from the 19th to 27th. 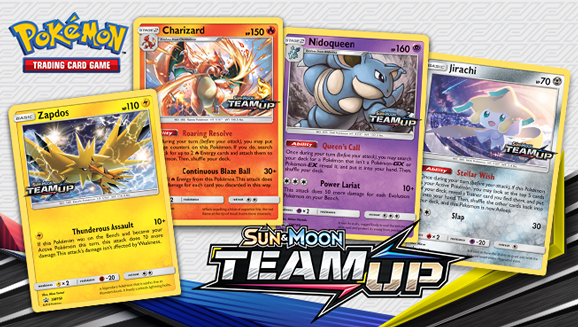 If you attend a Team Up Prerelease then you will receive one of four special art promos of cards from the set. These cards will be Charizard, Ninoqueen, Jirachi and Zapdos. Charizard will be a highly wanted card due to his popularity and potential uses. It has a powerful ability called Roaring Resolve. This ability allows you to attach two Fire energy from your deck but in return Charizard takes two damage counters. Charizard can attack with Continuous Blaze Ball which does a base 30 damage but 50 plus for each Fire energy you discard. If you are able to pull a Charizard from your Prerelease kit then expect to do some real damage. Jirachi is another highly wanted card. That is because of Jirachi’s Stellar Wish ability. 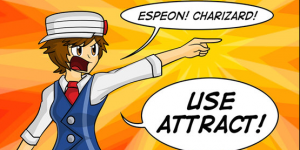 This ability can only be used with Jirachi in the active. If it is in the active then you can look at the top five cards in your deck and grab a Trainer found there. This could be used to get a much needed Supporter or Rare Candy. When you use this ability then Jirachi will be Asleep. Though, there are ways around this negative side effect. Zapdos is getting some buzz thanks to Thunderous Assault attack. This attack does ten damage but if Zapdos was place in the active this turn then it will do 70 more damage. That means you can do up to 80 damage for a single Lightning energy. If you add other cards such as Electropower then Zapdos can hit some big numbers. Lastly, there is Nidoqueen. This card has an interesting ability called Queen’s Call. This ability allows you to search your deck for any non-GX/EX Pokemon. If you are looking for the perfect piece for your board then Nidoqueen would be perfect. Power Lariat works with this ability because it does 50 damage more for each Evolved Pokemon on your bench. Team Up Prereleaes will be the weekends of January 19th to 27th. This set will be release on February 1st and legal for tournament play by February 15th. You can find your local prereleases by clicking here. Best of luck in your upcoming tournaments! 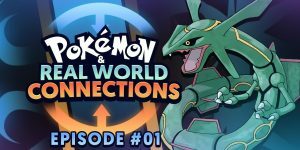 ← New Hoenn Pokémon GO Event Announced!